After experiencing months of Southwest Ohio’s pallet of browns, grays and blacks, the sight of green, purple and yellow poking up in the garden last week was like a breath of spiritual fresh air. It signaled the coming of longer days with sunlight, the greening of grass and trees and the blooming of flowers everywhere. And it heated up my eagerness to photograph outside. In my experience, more people are moved by color photographs than black and white. That’s understandable—color is more visually stimulating and it’s how we see the world. Our brains are wired for it. Regarding photography I’m reminded of the old saying that “If you can’t make it good, make it in color. And if you can’t make it in color, make it big.” This is especially true if the intent is to sell artwork. Generally speaking, in a painting or photograph, even in real life, the more vibrant the color or bigger the image, the greater its emotional impact. Even when the subject matter or their representation is small—the image above is small, but larger than the actual crocuses—it demands our attention. As a filmmaker and television producer I chose colors that would enhance the message or contribute to the sensibility of the environment, atmosphere or action. One of the items in my production toolkit was a chart of the psychological properties of various colors. I used it to determine the color of backgrounds, costumes, paint, objects and environments in real life and in electronically produced graphics because the challenge was always to capture and hold the viewer’s attention and generate an affective (emotional) response. This was especially true for commercials and public service announcements. I list here some of the general guidelines for making color choices when creating visual presentations. RED is masculine, stimulating and lively. It can signal passion, courage and strength. Depending upon the context it can also be aggressive and defiant. It was was my “go-to” color for creating excitement. BLUE is intellectual, the color of the mind. It evokes trust, serenity, reflection and calm. Strong blues stimulate clear thought and soft blues are conducive to consideration and reflection. 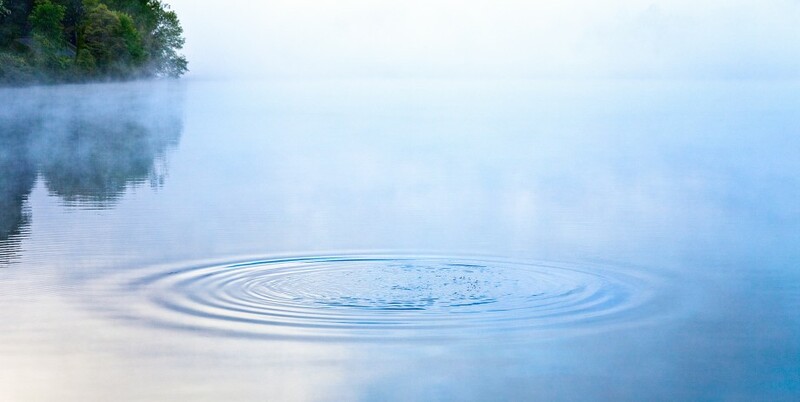 It’s why I chose the calm blue of a lake for the masthead of this blog. On the negative side—all colors have higher and lower vibrations and effects—it can convey coolness or aloofness. YELLOW is emotional, the color of optimism, friendliness and creativity. Bright yellow is open, encouraging and inviting. On the dark side, bordering on brown, it can promote feelings of fear, depression and anxiety. When a product, message or scene needed to convey a sense of confidence, that the advertiser could be trusted, I tried to incorporate yellow. GREEN is the color of balance and harmony. It conveys the sensibilities of peace, awareness and freshness—like an expanse of verdant grass. We have a natural affinity to green because it signals life, the presence of water and the potential for food. The lower vibration of green can be stagnation and sameness. VIOLET is spiritual on the lighter side, the color of awareness, vision and truth, even luxury. On the dark side it can be cloying and annoying, the vibrance being so strong it boarders on decadence or suppression. ORANGE reminds us of food, fruit in particular, so it contributes to feelings of comfort, abundance and security. On the bright side it photographs well in ads that contain food. Think of seafood commercials. Along with red and yellow it’s one of the “fun” colors used to enhance motivation. The dark tones of orange can convey the opposite—deprivation. BROWN is serious, referencing both the earth and waste. On the light side, its contribution to a message or product is stability and warmth. On the dark side, it can convey a heaviness, even depression. It doesn’t photograph well in ads containing food. BLACK is the mix of red, green and blue pigment. It’s also the absence of light. It’s sensibility can be dark, sophistication, efficiency and security. Positively it communicates clarity. Negatively it expresses oppression, coldness and heaviness. WHITE conveys a sensibility of purity, simplicity, efficiency and sterility. Just as black absorbs all wavelengths, white reflects them all. White light contains all the wavelengths. On the negative side it can convey strain, unfriendliness and coldness. Along with the psychological characteristics of color, I often shared with students the creative uses of color “harmony” and “discordance.” Color harmony is when one hue—such as reds, greens, or yellows—predominated in an image, whatever the medium. Because it’s rare in nature, it demands attention. Because such images create high impact and contribute to the experience of simplicity, their strength is in conveying beauty and emotion. Conversely, images that contain a variety of colors side-by-side—as when yellows and blues are juxtaposed—contribute to the experience of complexity. Their strength is in conveying information. Different communication objectives call for different strategies in using color. NOTE: The next time you’re in a Barnes & Noble bookstore, look for “The Civil War in Color: A Photographic Reenactment of the War Between the States” by John Guntzelman. Besides being a fascinating and well written reference, the book dramatically displays the significance of color in conveying historical realities. John’s thoroughly researched color choices are spot on. His latest book, “The Wild West in Color: A Photographic Account of our Nation’s Westward Expansion” is available for pre-order on Amazon, and judging from the cover it’s another demonstration of the power and significance of color. She asked me a lot of questions about the choices I made, and I had explained that the color white promotes healing spirit, that white light is a natural pain reliever, increasing and maintaining energy levels and relieving depression and inertia. White dispels negativity from the body’s energy field. I don’t get down on the ground to photograph anymore. 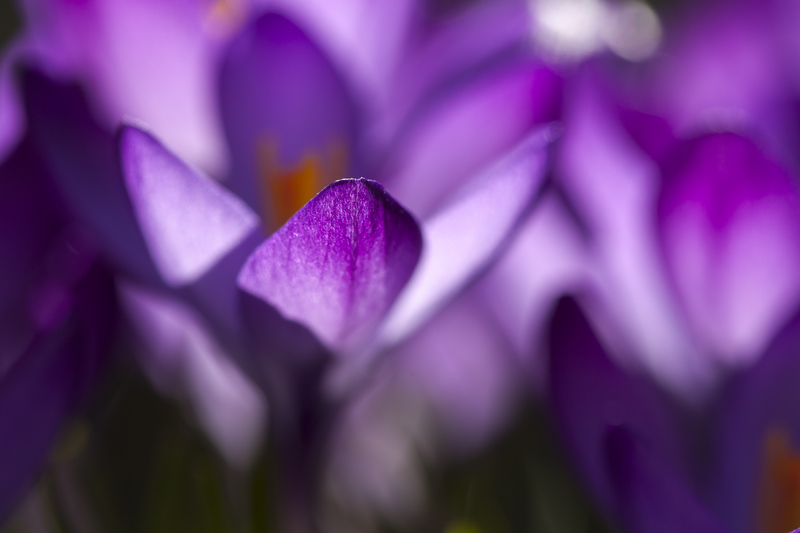 To make this shot I set a beanbag on the ground and, bending over, used the camera strap to position the camera on top of it—about ten inches from a clump of crocuses. Using a little battery device to trigger the shutter I made several exposures, moving the camera each time, up and down, left and right. Not looking through the viewfinder or the screen on the back of the camera—the sun was too bright to see it—is a risk, but I ended up with about twenty frames. As you see, I got one that worked. This entry was posted in Uncategorized and tagged Civil War, color, Crocus, discordance, emotion, harmony, information, Photography, psychology of color, Wild West. Bookmark the permalink.